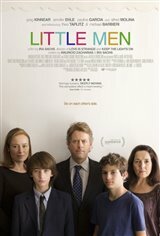 Little Men is director Ira Sachs’ follow up to 2014’s Love is Strange, and follows two disparate families who clash over their backgrounds and classes. Despite having very different personalities, an artsy 13-year-old boy named Jake (Theo Taplitz) and an extroverted kid his age named Tony (Michael Barbieri) become fast friends when Jake’s parents move into the same Brooklyn apartment. Jake's parents (Greg Kinnear and Jennifer Ehle) also happen to be the landlords of the dress shop run by Tony's single mom (Paulina Garcia). The new pair of best friends have their bond tested when their families get into a bitter battle over the dress shop lease, and the cost of its rent.